Living near intrusive neighbors can be a challenge. Especially when they howl in the middle of the night, slither through your yard, chew on your house, and steal your food. Wildlife neighbors certainly can present problems at times. 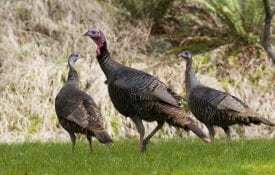 Yet wildlife also can be beneficial and even enjoyable neighbors. We just need to get better acquainted. When you think of wildlife you might like to see in your backyard, you probably imagine rabbits, gray squirrels, hummingbirds, songbirds, and butterflies. But it is not uncommon to see bats, armadillos, skunks, raccoons, opossums, red foxes, coyotes, and deer in suburban areas. Some of these species— namely raccoons, opossums, foxes, and coyotes—can even live within big cities. Birds of prey, such as red-tailed hawks and American kestrels, and even the occasional wild turkey can be drawn to your yard. Other guests such as snakes may also think your backyard is a good living space. When you first encounter an animal with which you are unfamiliar, it is natural to be suspicious and even startled. The presence of a coyote or raccoon may make you nervous. But try not to let emotions guide your response to wildlife in your yard and around your neighborhood. Most wildlife attracted to your community does not represent a threat to you, your children, or your pets. While it is true that you should never approach wildlife or encourage them to approach you, most wildlife will avoid you. The likelihood of being attacked is miniscule. 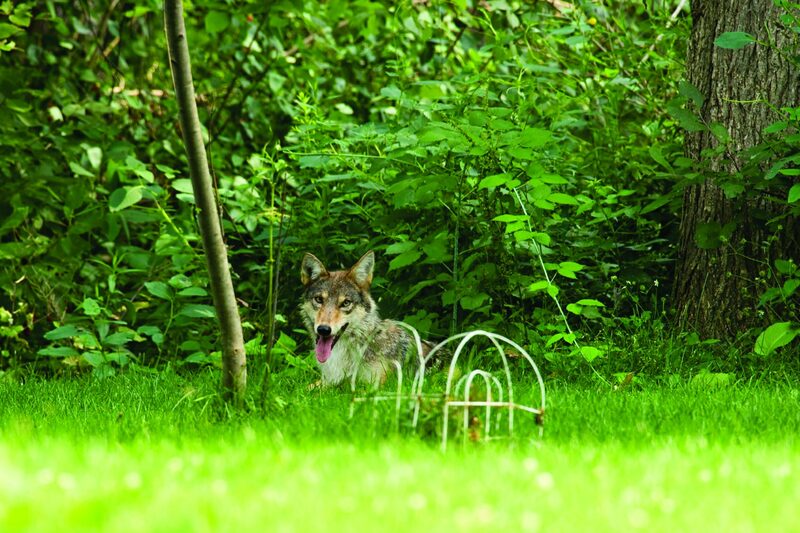 Homeowners tend to feel particularly concerned if a coyote or fox is spotted. While considered predators, they are omnivorous. Their prey consists largely of insects and small mammals such as rodents and rabbits. They may occasionally eat domestic cats and small dogs when they are easily available, but the frequency is low to nonexistent in most areas of Alabama. Keeping pets inside is the best defense. This action also benefits harmless wildlife such as songbirds, which are frequently killed by pets. Homeowners may feel concerned that wildlife carry diseases. 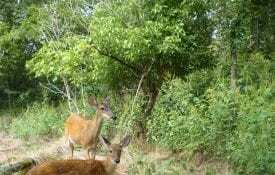 While certain diseases such as rabies and canine distemper can be carried by wildlife and transferred to people and pets, it is unusual to encounter diseased wildlife. Wildlife exists on the very edge of life and death. Most diseased animals die shortly after becoming infected and rarely survive long enough to encounter people and pets. Seeing a healthy wild animal during the day is not unusual, especially if it has grown used to the presence of people. If you are concerned about the health of a particular animal, watch from a distance to see what it does. If it approaches you, acts deliriously, or seems uncoordinated, it could be sick and should be avoided. Contact your local animal control officer if you suspect that a wild animal in your area is sick. Top Left: While some species are content to live near you, others may try to live with you. Top Middle: Some birds of prey, such as this red-tailed hawk, can live within city limits. Top Right: White-tailed deer are common in some suburban areas. Bottom Left: Red foxes may live next to or under your house. Bottom Middle: Opossums are frequent backyard visitors. Bottom Right: A gray squirrel is a common sight in suburban backyards. A common fear among many homeowners is the presence of snakes in the yard. If you live in a wooded area or have a small pond on your property, you may frequently see snakes. Don’t be afraid. Be informed. That means being aware of your surroundings when you’re outdoors, watching where you step and put your hands. And it means being knowledgeable of snake species. The majority of snakes in Alabama are not only harmless to people but are extremely beneficial as pest control of mice and rats. Of the approximately forty species of snakes found in Alabama, only six are venomous. What’s best, the venomous species are easily distinguished from the harmless ones. Learn how to identify snakes from the Alabama Cooperative Extension System at www.aces.edu. Two excellent references are Identification of Snakes in Alabama for Forest Workers (ANR-1038) and Identification and Control of Snakes in Alabama (ANR-0597). So why won’t these neighbors stay out of your yard or at least mind their own business? The answer is simple: It’s their yard too. Many housing developments are situated at the outskirts of cities, where farmland or woodlands once stood and where wildlands begin. By moving into those developments, we’ve moved into the habitats of many wildlife species. Some of these animals, such as bobcats, are secretive and may not choose to live near you. These species may quickly decide to leave when you move in. Many others, however, may stay in the surrounding area or try to inhabit the altered environment of your backyard. In more urban settings, where the land was converted to city use long ago, some wildlife species have adapted to take advantage of a new type of habitat. Species such as gray squirrels and groundhogs live well within the patches of habitat seen along the sides of roads and in parks. Others are at home in attics and basements, nesting or roosting on the sides of buildings, or raiding garbage cans for easy food. Whether you moved into wildlife habitat or the wildlife moved into yours, the problems can be the same. With enough time, money, and effort, it may be possible to exterminate some pests from your property. Without changing the way you manage your yard, however, more animals will quickly fill the unoccupied space. You may even be encouraging pest species to inhabit your yard without meaning to. An always available, always full bowl of cat food on your porch is an open dinner invitation to coyotes, foxes, opossums, raccoons, skunks, and even crows. All of these species can and will eat your pet’s food. The easiest way to control wildlife is to change your habitat so that it is inhospitable to them. The table on page 3 shows a few things you can do to discourage wildlife from living in your yard. You may not be able to change some situations. It may be possible to mow your yard, but if you live next to a wildlands area there may be little you can do to keep out wildlife. In such cases there are a few steps that may make it easier to live a little on the wild side. When wildlife won’t leave your yard, put them to work. Wildlife that may seem unwelcome at first glance can provide valuable benefits. Take bats, for example. They may help to control insects that damage crops and irritate people. Many snakes are excellent mouse and rat catchers. Some harmless snakes, such as king snakes, can even help to control any venomous snakes that might enter your area. Rabbits enjoy eating forbs, such as dandelions, that interfere with your lawn. Squirrels and birds help to disperse seeds that will sprout ornamental plants and trees. Besides the basic protective services that wildlife can provide to your home, they can also be a source of enjoyment and education. Feeding birds can be a rewarding hobby. If you enjoy photography or wildlife watching, you may be able to hone your skills right from home. Children can experience nature firsthand without having to watch it on television. Interesting school projects can center around your backyard with little expense. In short, there is no end to the possibilities. Top Left: Bats provide a valuable service by consuming pest insects. Top Right: Keep tight-fitting lids on trash cans to discourage wildlife from raiding and scattering your garbage. 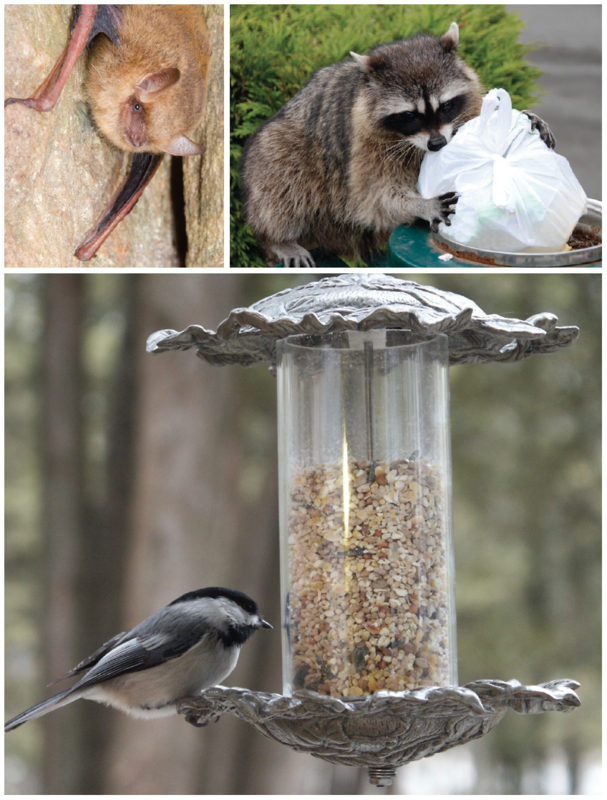 Bottom: Except for using bird feeders, you should not approach or feed wildlife. If you choose to move into an outlying area, keep in mind that the neighbors you are moving next to are still wild. Having wildlife live in close proximity to you can be exciting, but remember that these animals are not tame. Although many of these wild neighbors are extremely cute, they are not pets. They have adapted to live near people, but they have not lost their wild behaviors. For this reason, you should not approach or feed wildlife (except for using bird feeders). Humans have a responsibility to wisely use the resources in the environment. Try to remember that your uninvited guests are not attempting to make life difficult. They are simply attracted to your area for the same reason you are. In your neighborhood or yard they can find peace, quiet, and the convenience of home and table. 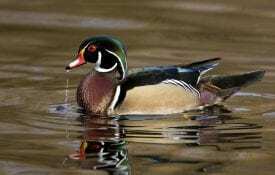 Many people firmly believe that wildlife should exist only outside of the human environment. Much of the natural environment, however, has been converted to human habitat. There are few truly wild places left for animals to live without encountering people. Instead of the inconvenience, think about how thrilling it is to be able to experience some of the remaining wild America in your own yard. Living with urban and suburban wildlife can offer both opportunities and challenges. Wildlife is not tame, but most species do not pose any threat to your family or pets. Certain pest animals can be removed, but it will be more effective to alter your behavior to be less inviting to unwanted visitors. Some wildlife may stay in your yard or neighborhood, even if you try to discourage them. Think of ways these species can benefit you, and realize that you are experiencing a vanishing American wilderness in your own backyard. The next time your wild neighbors get a little loud, relax and try to enjoy the wild life. 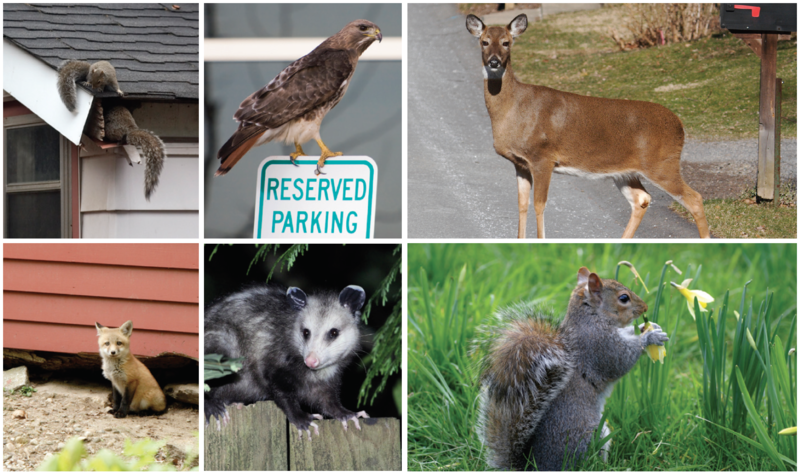 Download a PDF of Wild Neighbors Living with Urban & Suburban Wildlife, FOR-2034.